Leaf through issues of Vogue Italia from the '70s and you will instantly spot quite a few pieces, ideas and garments that look extremely similar to what's in the shops at the moment. 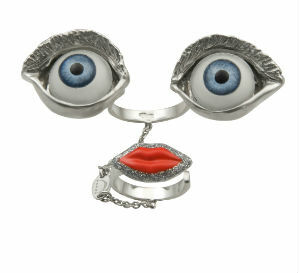 One very striking example is a Surrealist necklace with eye and mouth pendants by Niki de Saint Phalle that has been pilfered, remixed and re-edited by Delfina Delettrez in her own jewellery pieces (View this photo) and in her supposedly unique collaboration for the A/W 2013-14 season with Kenzo (characterised by the eye motif; View this photo). 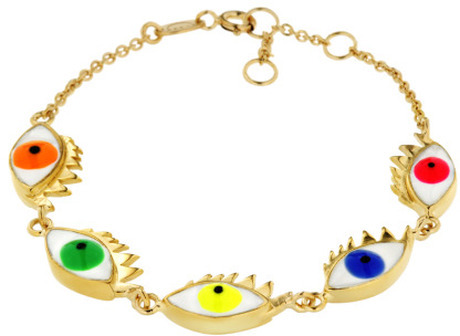 It was Milanese goldsmith GianCarlo Montebello who persuaded Niki de Saint Phalle (and together with her a long list of modern artists including Lucio Fontana, Hans Richter, Jesús Soto and Alex Katz) to collaborate with him, creating iconic jewellery under the Gem Montebello label. It would be absolutely amazing to see a proper jewellery exhibition featuring Montebello's own creations and the designs made for Gem by famous artists, but, in the meantime, if you like Niki de Saint Phalle, you may want to check out the exhibition "En Joue! Assemblages & Tirs (1958-1964)" at Galerie Georges-Philippe & Nathalie Vallois in Paris. The exhibition features the artist's assemblages and "Tirs", that is paintings created by shooting a .22 rifle and puncturing packets of paint that released their contents onto the plaster reliefs. The action of firing with a gun at the containers of paint lodged in her assemblages made with assorted found objects and toys plastered on wood and sometimes incorporating other materials such as polythene, engendered a live action painting and a theatrical performance. Niki de Saint Phalle's first shooting paintings were showcased in 1961 at the "Tir à volonté" exhibition organised by Pierre Restany at the Galerie J, with Leo Castelli, Robert Rauschenberg, Jasper Johns and all the Nouveaux Réalistes in attendance. Among the works at the Galerie Georges-Philippe & Nathalie Vallois there are the miniature "landscape-assemblages" from 1958, the famous "Pirodactyl over New York" (the last big "Tir assemblage" made in 1962), the studies for the big King Kong from 1963, and her "Hearts" and "Cathedrals". One of the most famous pieces remains the "Portrait of my lover", a work de Saint Phalle created in 1961 to take part in the Salon Comparaisons. The artwork consists in an assemblage of a shirt stolen from an insistent lover she was trying to get rid of and a target in the place of his head that visitors were supposed to shoot at. This piece predates Niki de Saint Phalle's "Tirs" and, like her shooting paintings, remains fascinating. Through her assemblages and "Tirs", de Saint Phalle tried indeed to create new surfaces and shapes, sparking dialogue between objects by combining them together and then destroying them in a violent act that actually produced colourfully intriguing effects, a process that should lead to more inspiring artworks or designs in fashion, rather than to mere recreations of her original works. 98 3/8 x 122 x 11 3/4 in. © 2012 Niki Charitable Art Foundation. All rights reserved. 78 x 48 x 9 7/8 in.